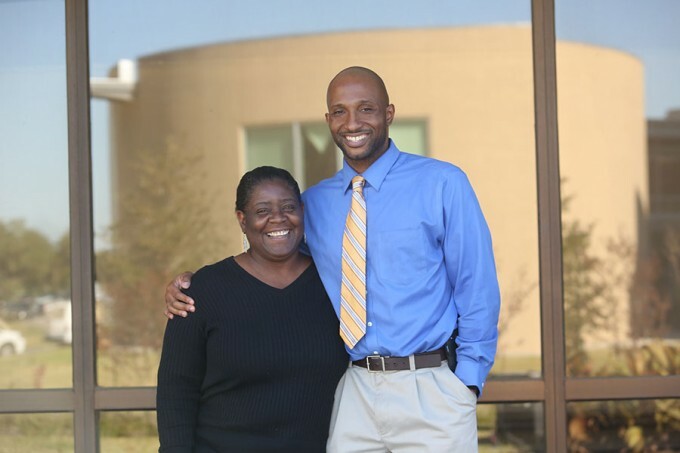 Bauer program coordinator Jonathan Hill and program manager Joyce Williams are two Bauer staff who go above and beyond the call of duty to make a difference. Children across the area have been penning letters to Santa and dropping hints to their parents on presents they’d love to receive this holiday season. A group of students from Cullen Middle School got to unwrap a very special and much needed gift in November, thanks to help from Bauer College staff. Joyce Williams and Jonathan Hill, who work in the college’s Undergraduate Business Programs office, partnered with UH Mobile Eye Institute director D. G Gavin Gerondale, Graduate School of Social Work Research Professor Larry Hill, Epiphany Community Health Outreach Services (ECHOS) executive director Jean Kegler and “Be a Champion” CEO Jaron Barganier to deliver eyeglasses to Cullen students. A group of Bauer students including Sean Amenson, Vugar Asadov, Jacob De Castro, Micheal Haskins, Anum Lalani, Timothy Paz and Selena Salinas were also involved in organizing the project through their GENB 2301 class. The college’s Undergraduate Business Programs office frequently participates in outreach efforts aimed at the middle school students in the Houston area. Williams, a program manager in the office, echoed that sentiment and noted the importance of getting involved with youth who are at a critical point in their lives. The next installment of Bauer Gives Back will be posted on www.bauer.uh.edu on Friday, Dec. 7. Do you have a suggestion for someone who should be recognized? Email Director of Communications Jessica Navarro at jnavarro@bauer.uh.edu.